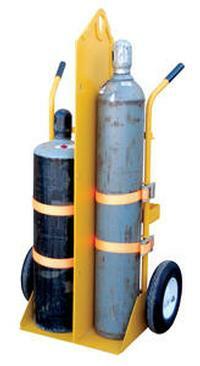 Designed for transporting cylinders and cutting torch. 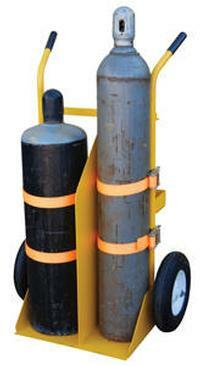 Includes two tank compartments with heavy-duty ratchet straps. Brackets are included for holding cutting torch and hose. 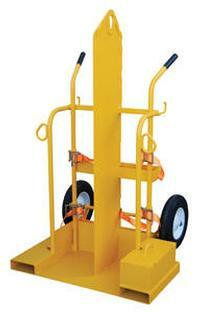 Sturdy handles and large 16" diameter wheels for tilt-n-go portability. Heavy-duty uniform capacity rating is 500 lbs. Convenient open-top storage tray included on all models. V-CYL-2 models (Pic. 3) include lockable storage box for regulators. Box includes hose opening so regulator does not need to be disconnected for storage. Lifting eye (Pic. 4) is 2" maximum diameter, material thickness is 7/16". Fork pockets for transportation is included on V-CYL-2 models. Usablesize of each fork pocket is 7 1/2"W x 2 1/2"H. Units with fire protection include 1/2" (approx. 13mm) Marinite 1 material which provides a 30 minute fire protection barrier as prescribed by OSHA standards 1910.253 and 1926.350. Welded steel construction with painted finish. 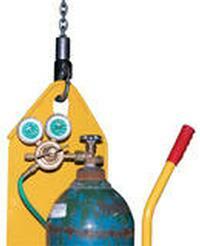 Not designed for use as a storage means for gas cylinders.